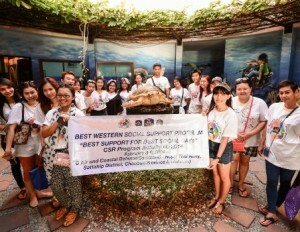 Best Western has helped conserve Thailand’s marine environment with a weekend CSR initiative and charitable donation. A group from the company’s Asian head office in Bangkok recently spent the weekend in Chonburi province, east of the Thai capital, where they participated in two local projects designed to protect the local sea life. On Saturday 8 February, the Best Western volunteers sailed out to the Kham Islands, in the Gulf of Thailand, where they joined the Royal Thai Navy to help preserve the area’s coral reefs. Following a demonstration of coral conservation techniques by naval officers, the team helped transplant the island’s reef, which is in danger from coral bleaching. The volunteers then returned to the mainland, where they had the opportunity to visit the local Sea Turtle Conservation Centre and release young turtles back into the sea. “Best Western aims to be a force for good in every market we operate, and this latest CSR initiative is just one example of the work that our teams undertake across the world,” said the company’s vice president of international operations for Asia & the Middle East, Glenn de Souza. “Thailand’s coast is one of the key reasons why so many visitors travel to this wonderful country every year. And as such, it is the responsibility of the tourism industry to help preserve and protect this incredible marine environment. “At Best Western, we are committed to this challenge and we are delighted to be able to give something back to the coastal community,” de Souza added. Best Western also presented a charitable donation to the Sea Turtle Conservation Centre, enabling it to continue its work in the future.